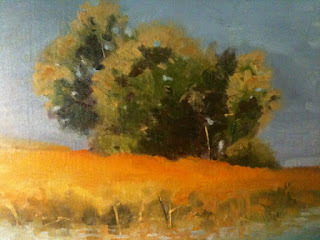 The late summer landscape was a painting I did under the instruction of artist Richard Abraham who I am studying with. I started out poorly, scraped the board clean and started over. The second version began with a sketch and blocking in the major colors, cool to warm, dark to light. The result was satisfying. The painting on the top was done by applying some of the techniques I picked up from Richard.